WINTER FEED: THESE COWS AWAIT THE FENCE TO BE MOVED TO GRAZE ANOTHER STRIP OF STOCKPILED FESCUE. The very dry fall induced an alternate strategy for feeding cows this winter. 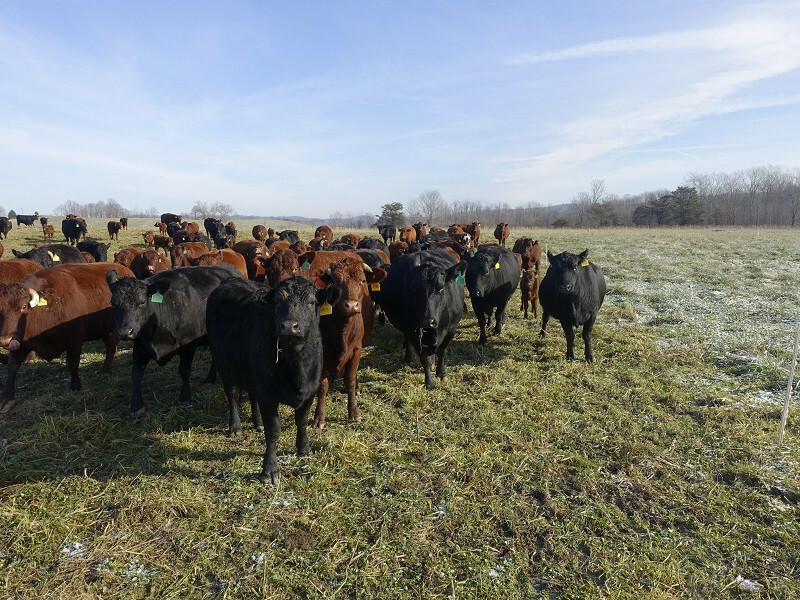 Typically we first graze through all fescue pastures, which usually takes us into February, and then feed hay for another six weeks until grass begins to grow. This approach works well when the period for feeding hay is relatively short. Because quality of hay is generally fairly poor and our cows are lactating, we can't extend this scenario much longer than two months. 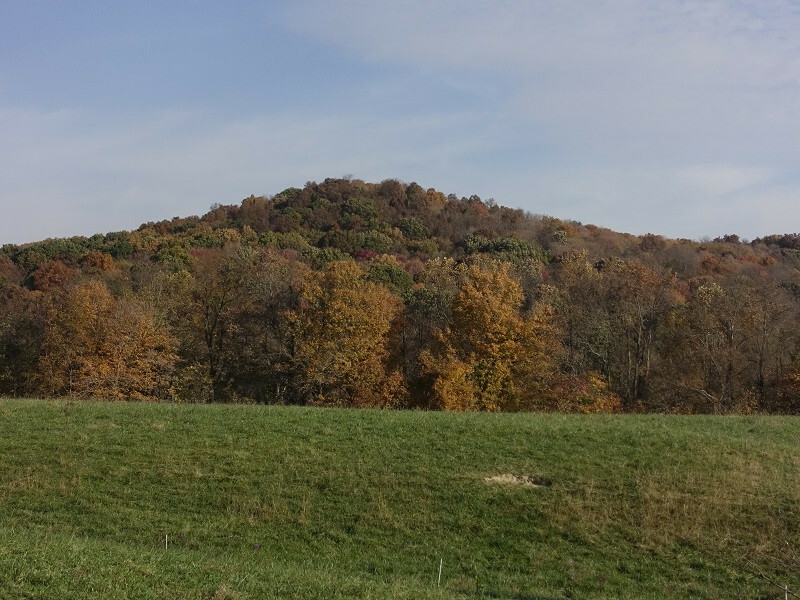 Given the dry fall prevented normal growth of pastures this year, we would be out of grass by the end of December, had we adopted the typical strategy. BUILDINGS: BUILDINGS ARE ALL WOMANLY. ... bringing lightness to nearby woods, charred by fire. 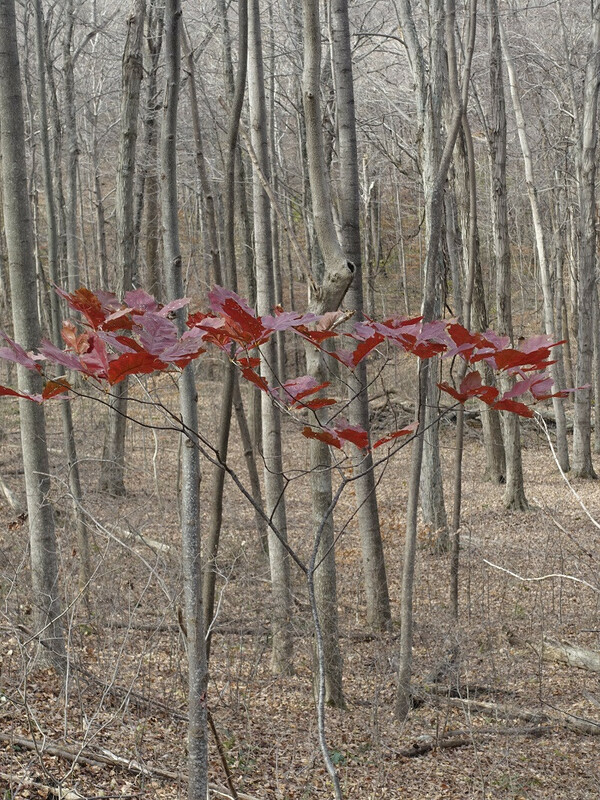 This is a great time of year to witness the character of trees in the forest. When travelling back from charred acreage several weeks ago, the beauty and intrigue of the naked trees caught my attention. The forest felt particularly magnificent and courageous, like the homeplace of Nature, spawning and harboring all of life. The smooth grey of Beech trees both reflected and obscured light, bringing brilliance and shadows to winter woods, as in the lower left. One tends to think of trees as being linear and erect, but the Maple sapling on the lower right experienced a humorous and perhaps painful detour to its path, as transpires with so many of us... The human story is fully recounted in the forest, which is why we have to protect it. For it is us. We have enjoyed beneficial rains every week of the spring and summer, making for an ideal growing season, until mid-August. Since then, we have not received more than two inches of rain. Two Saturdays ago, the wind was high, the grass was dry, the leaves on the forest floor were very dry, and a neighbor at the top of the hill started an habitual trash-fire in her back yard around noon. By 1:00 we could see thickening and spreading plumes of smoke billowing into the sky. We could also hear sirens of fire engines approaching. The trash-fire had escaped onto dry grass and rapidly advanced into our forest. A level of dread arose, from our distance, as the prospect of a full-fledged forest fire seemed imminent... Fortunately, the neighbor had called the fire department right away, and by the time I arrived at the scene with shovel in hand, the flame was largely contained by heroic firemen. 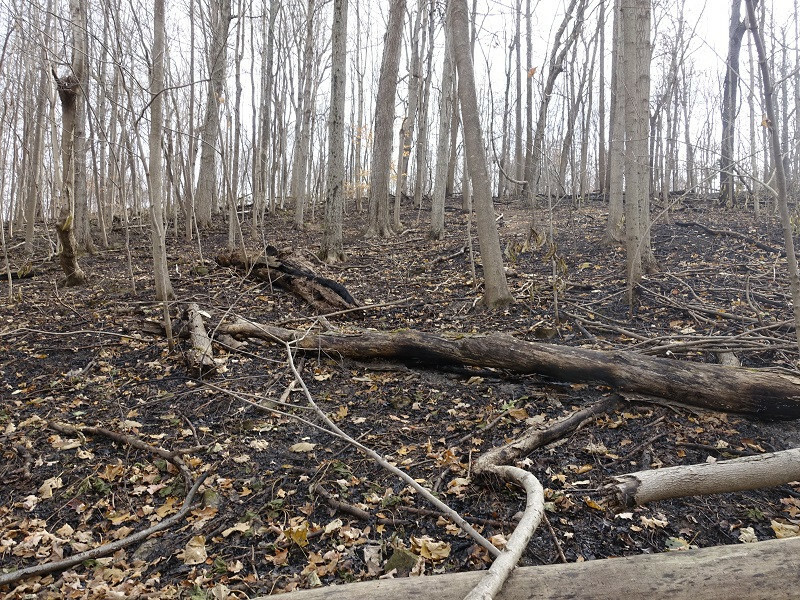 But several acres of under-story of our woods had burned and could have spread over several hundred acres. It was a very close call and an alarming event that caught everybody's attention. This brief experience with large fire apprised me how small and vulnerable one is when confronting a serious inferno. Interestingly, the primary tool for arresting the spread of the fire was a leaf-blower, as depicted in the picture below on the right. 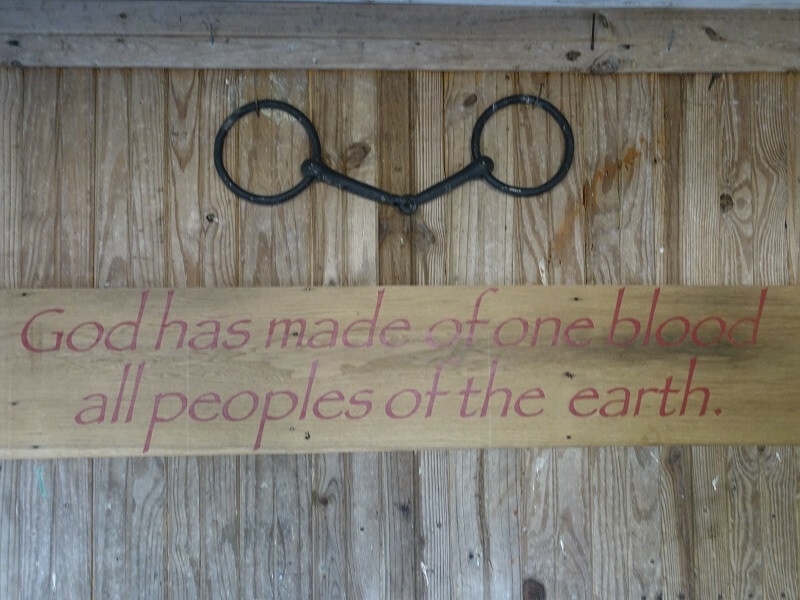 This hand-painted statement is affixed in our barn. It stems from Acts 17 in the new Testament, and first came to our attention through Berea College, where it serves as a cornerstone of values. The extensive and active dialogue in which this country is now engaged is reminding us of our commonality, above all, and how we are indeed of one blood. AUTUMNAL ODYSSEY: COLORS OF LEAVES ARE CHANGING SLOWLY, ENRICHENING THE ODYSSEY AT THIS TIME OF YEAR. We wrestle with some anxiety as the leaves turn, because the odyssey that faithfully takes us from summer to winter, and from summer markets to winter markets, typically reduces our income by half. Many regular customers from the summer market disappear over the winter. We wonder why - perhaps because the social aspect of the marketplace is less, the winter market is more inconvenient due to adverse weather, or the novelty wears off... But nutrient-dense foods are not novelties; they are basic staples of life, upon which civilizations and well-being have depended over millennia. 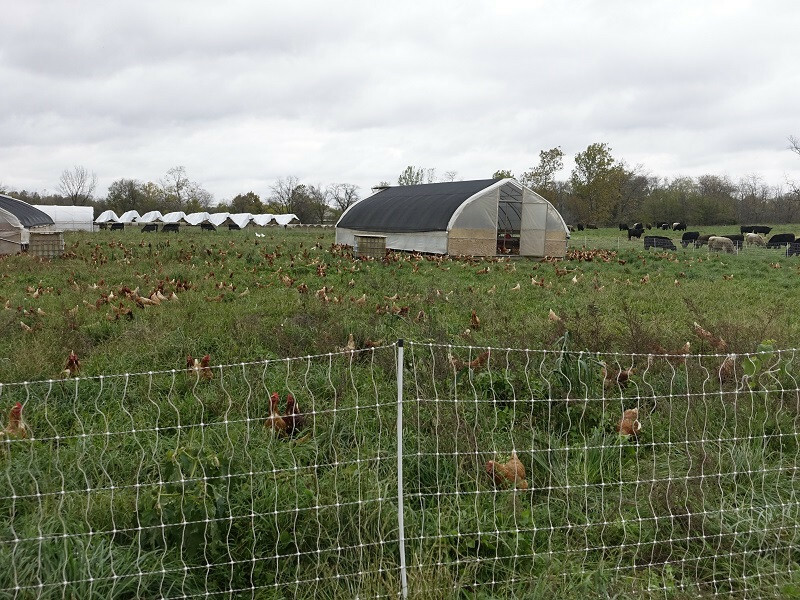 SEVEN SONS FARMS: YESTERDAY'S VISIT TO SEVEN SONS FARM WAS INSPIRING. 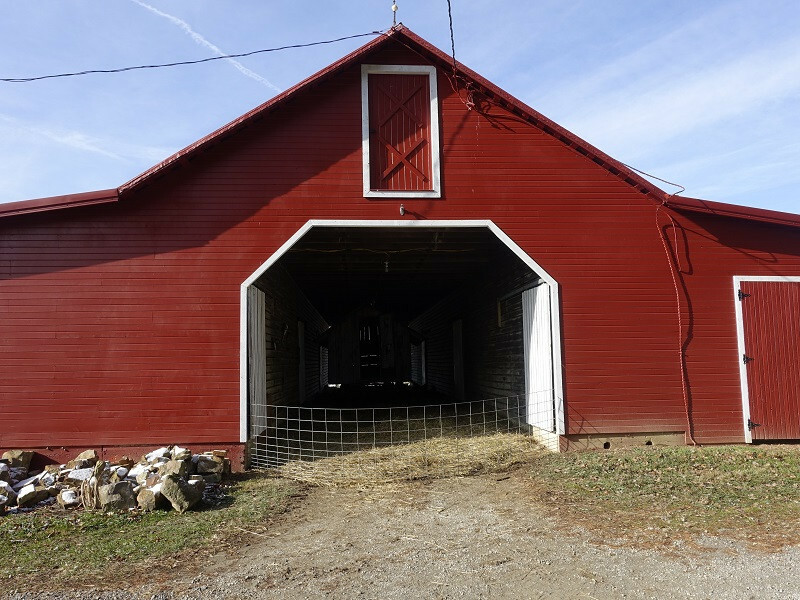 This farm is located 20 miles from Ft. Wayne, Indiana and is run by the seven sons of Mr. & Mrs. Hitzfeld. 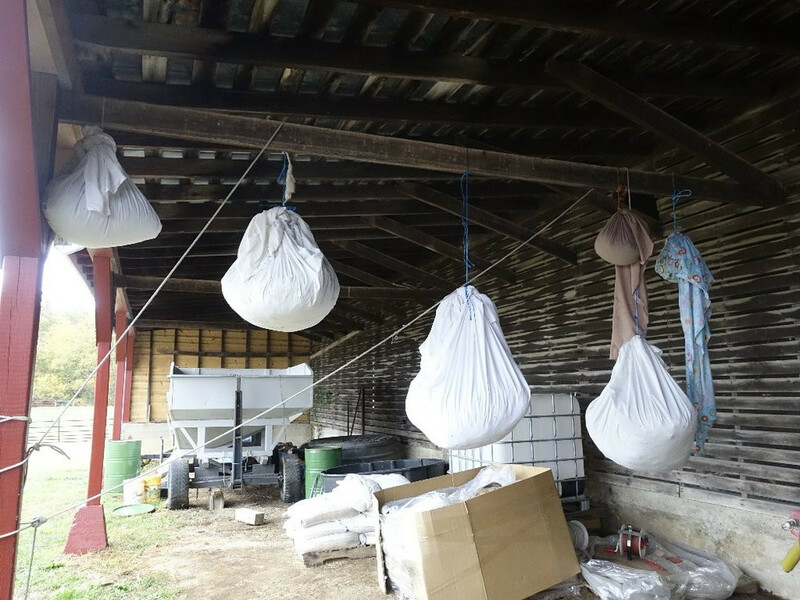 They have been direct-marketing pasture-based foods since 2000, and have become the dominant producer and marketer in the Midwest, distributing product to cities throughout Indiana, Illinois, Ohio, and Michigan. All of their business is conducted through on-line transactions and deliveries to neighborhoods every six weeks. What is more, they are willing to consult with aspiring producers and marketers, like ourselves. It seemed prudent to sit at their feet for several hours, and it was. Below are Blaine and Blake, both of high character and intelligence. COLLECTING SEEDS: WILD SEEDS ARE DRYING IN SHEETS AND WILL BE SPREAD THIS WINTER. Seeds for Wool Grass on the left below and Elderberry on the right have been painstakingly collected this past month by Naturalist - Kathy Kipp. They, along with False Indigo, Nine Bark, and Buttonbush, are drying in thrift-shop sheets, by hanging in the wind. They will be cleaned, sifted, and then broadcast in December by Kathy and Jacob Bartley onto bare patches of soil, in 100-foot buffer zones surrounding our wetlands. 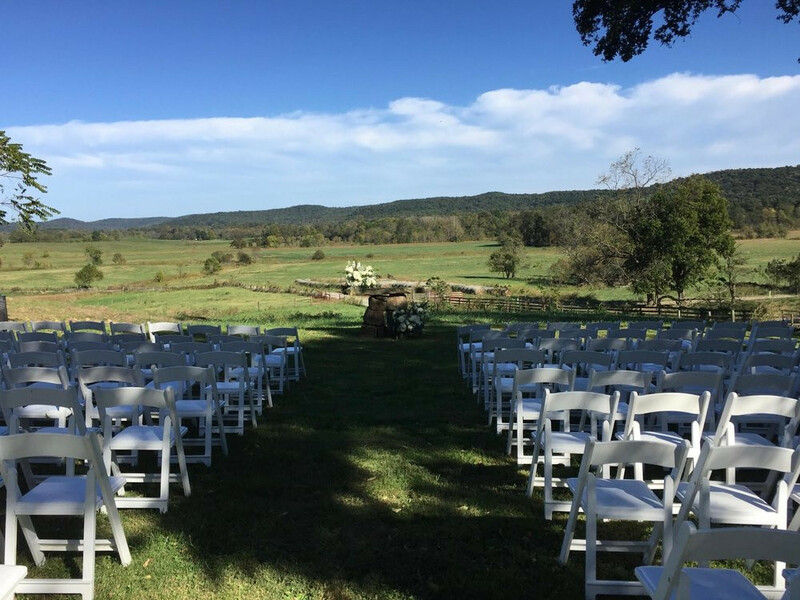 WEDDING CELEBRATION: WE CELEBRATED A WEDDING AT THE FARM THIS PAST WEEKEND. Daughter-Mary and her new husband, Leighton Zema, were betrothed this past Saturday at our farm. 180 people attended from all corners of the continent and one even from Dubai. Lodging was secured 40 minutes away in Chillicothe, and buses transported guests back and forth. We held a hog-roast on Friday night, a farm tour on Saturday morning, and the wedding ceremony, in dramatic shadows, Saturday afternoon. The ceremony was officiated by Mary's brother, my son, before the stone altar, bedecked with stunning flowers, and heralded by a flock of soaring, black, turkey-vultures against a clear blue sky above. Dinner was held under a large tent, sporting banners, peaks, and sloping sides, that might have been staged in the sands of Arabia. Michelle Vollman, of La Petite Pierre in Madeira, supplied an excellent dinner, delivered by 24 servers who arrived in a school bus. A band from Atlanta arrived in their own bus at noon and departed at 3 AM, leaving behind the most professional presentation of inspired dancing-music most of us ever witnessed. 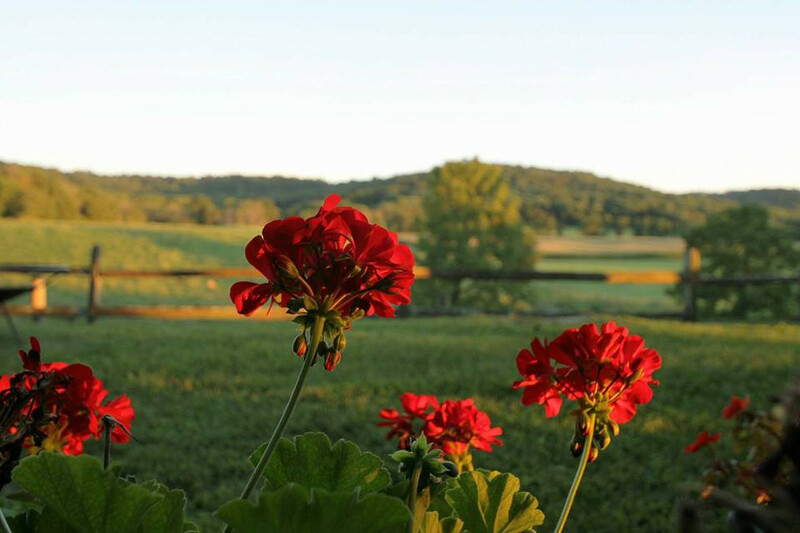 The weather was perfect, the farm looked beautiful, the guests were so appreciative, and spirits were high. 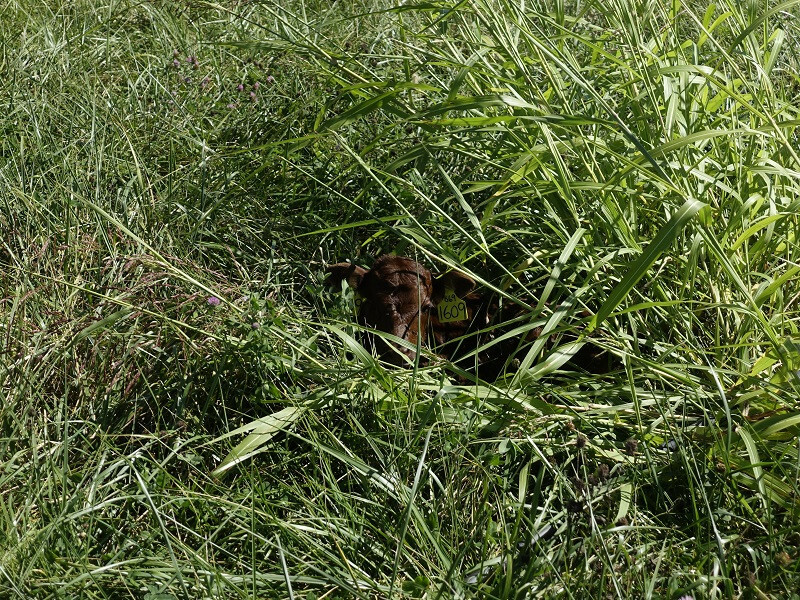 CALVING SEASON: THIS NEWBORN FINDS COMFORT IN TALL GRASS BY MAKING A NEST. Magnificent cows are now giving birth to beautiful calves. It is an exciting time of year, when a harvest of life rolls in. Most of the cows are faithful in their maternal duties, persisting year after year. Two of our best are 13-years-old. Note in the pictures below their good body condition - in full flesh and with shining coats. This indicates health and high butterfat in milk, enabling calves to thrive. Calves that don't receive enough butterfat during their first six months, never do well their whole lives. 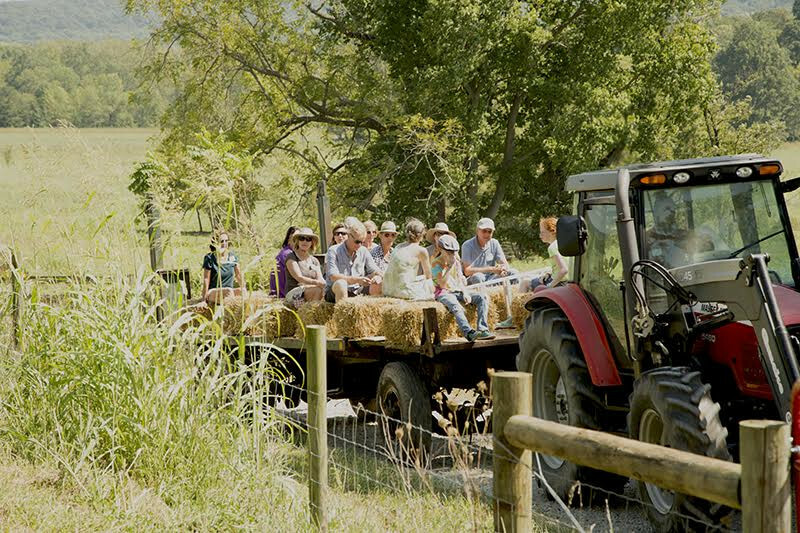 FARM TOUR: WE ENJOYED A GREAT TOUR TWO WEEKS AGO. Thirty people walked, talked, and dined with us. The weather was beautiful, grass green, livestock in full form, and many good questions posed, resulting in very engaged discussion. We appreciated the time invested by those who made the journey to see our landscape, its animals, and its people, in order to witness the philosophy by which we operate. We viewed cattle, sheep, hogs, laying hens, and guard dogs. We also walked through pastures and talked about grass, organic matter, water, sustainability, and food! BE NOT FEARFUL…: ... TO ENTERTAIN STRANGERS, FOR THEREBY SOME HAVE ENTERTAINED ANGELS UNAWARES. Two weeks ago, a stranger spent an afternoon and evening with us at the farm, disguised as a friend of a friend... She turned out to be an angel... Here is her report on the visit.